California has a “Mediterranean” climate, which means that each year it has a concentrated rainy season, followed by a long temperate and dry period. California’s rainy season typically runs from early October to late March, with very little precipitation outside of these months. (Figure 1 shows the average monthly rainfall for California.) It is now early 2014 and the rains have not come, for the third year in a row. While the definition of “drought” varies from place to place, it is safe to say that California is currently suffering from a severe – and by some measures, unprecedented — drought. 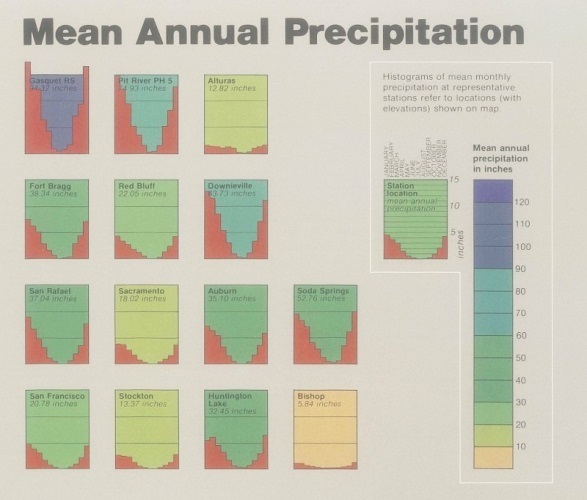 Figure 1: Monthly average precipitation showing the seasonality of precipitation in different parts of California, from the iconic California Water Atlas. It is not too late for some big storms off the Pacific Ocean to bring relief. But the odds are against it and current meteorological conditions are not encouraging. If the rest of the winter months are dry, or even of average wetness, the state will have much less water than normal, and much less than water users want – from cities to farms to our natural ecosystems. We’ve had dry periods before – they are a recurring feature of our variable climate. The difficulty, expense, and pain of droughts, however, depend on two things: how severe they are and how we react. The Pacific Institute has spent many years studying the effects of droughts in California and has published several analyses of past impacts and responses (here and here). Based on past experience, here is (part of) what Californians can expect this year if it remains as dry as it is now. Urban water agencies will (and are beginning to) roll out a wide range of voluntary and mandatory water “conservation” programs. These typically ask customers to limit discretionary water uses such as watering gardens and washing cars and sidewalks. As droughts worsen, agencies expand these programs to offer incentives for both structural and behavioral changes: purchase more water-efficient appliances, remove grass and plant water-efficient gardens, cut shower times, and more. In the past, these kinds of programs and educational efforts have temporarily cut urban water use by between 10 and 25% depending on the programs and level of effort. 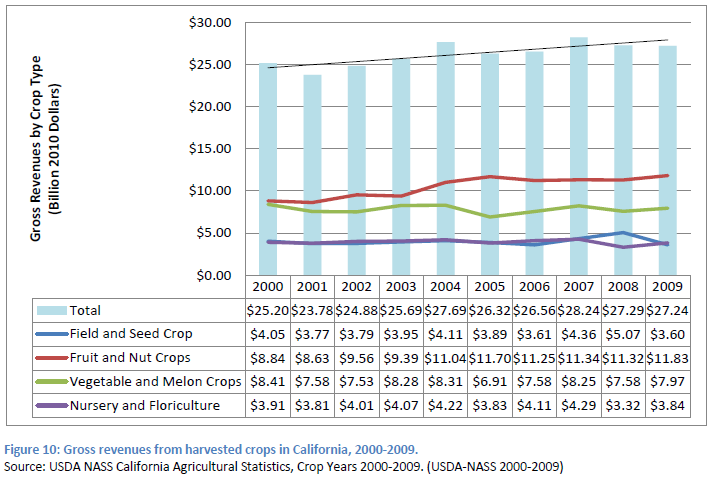 Figure 2: Agriculture revenue by crop type in California, 2000-2009, including during the 2007-2009 drought (billion 2010 dollars). 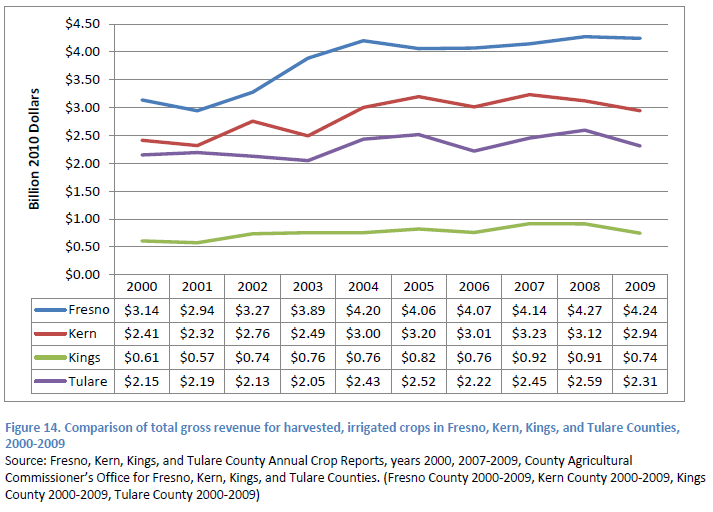 Figure 3: Agriculture revenue in four major agricultural counties in California, 2000-2009, including during the 2007-2009 drought (billion 2010 dollars). The generation of hydroelectricity at California dams will drop dramatically from average levels because it varies directly with streamflow. Because renewable hydropower is among the cheapest and most versatile of electricity sources, California ratepayers will have to pay for more costly fossil fuels to make up for the difference. In the past, the drop in hydropower has been largely made up by burning more natural gas, costing Californians billions of dollars in added energy costs and generating more greenhouse gases to the atmosphere. The same is likely to happen this year. Natural ecosystems are likely to suffer severely, especially fisheries in the Sacramento-San Joaquin river delta (the “Delta”). These ecosystems are already under severe pressures due to water diversions and other stresses. The California Department of Water Resources described some of these past drought impacts here. During past droughts, political pressures have been applied to increase diversions of water away from ecosystems. Some groups and politicians have pointed to legal decisions restoring some minimum flows to ecosystems as the cause of hardship to some California agricultural interests and used droughts to push for exemptions from these decisions, increasing ever-present tensions among different California water interests. This is also likely to reoccur this year. Wildfires could be more frequent or severe, and the wildfire season may expand into normally wet months. Soil moisture is already extremely low; vegetation is likely to die in the foothills, coastal ranges, and Sierra; and these factors can increase fire danger. Prices of water are likely to rise, in part because of the real cost of water scarcity, and in part because our water rate designs still too often penalize efforts to conserve water, leading to higher rates during droughts even when water use goes down. The Pacific Institute has described water rate strategies to address this problem, but more could be done to improve rate designs. Droughts are a natural part of our climate, even without the complication of climate change, which has the potential to significantly alter the patterns of both water availability and demand in the coming years. In part, our massive water infrastructure (dams, reservoirs, aqueducts, and management institutions) has been built to help us manage this natural variability. But we could all be doing much more to reduce our vulnerability to extreme events. In the short term, water agencies, managers, and users will look to the temporary fixes mentioned above, including behavioral changes, to help cut demand for water to a level that more closely matches reduced supply – and we should not sacrifice our natural ecosystems for short-term water needs. In the long term, we need to make permanent fixes (and prepare for climatic changes). Despite our efforts in recent decades, California water use still remains unnecessarily profligate and inefficient. Many of us still have old toilets, showerheads, washing machines, and other appliances and we must replace them. We still grow water-hungry field crops and even some fruits, nuts, and vegetables with flood irrigation and we must further improve irrigation efficiency. Some homeowners still insist on having lawns that mimic those in the humid East (or more accurately in far wetter England), and in our current climate we should instead plant native vegetation that uses less water. Most of us still pay too little for our water. Higher prices would more properly reflect the true cost of getting, treating, and using water in California, though we must also protect economically disadvantaged communities. And we must seek out and explore new, renewable sources of water, including especially water treatment and reuse, rainwater harvesting, and brackish water desalination. The reuse of water – already underway in some places around the world, including some efforts in California – is one of the most promising ways of expanding the apparent supply of water for many non-potable, and even potable, uses. California is a spectacular home, and we choose to live in its dry and variable climate. Our water behaviors should match and respect this environment, even during normal times, but especially, and critically, during drought times. Thank you for your comment. Yes, partly this is true, though one advantage of improved efficiency and conservation IS the ability to satisfy new demands within the limits of existing supply. But your comment also raises the important point that we must integrate long-term planning with water policy or the improvements get swamped by uncontrolled new demands. The other issue is “hard” improvements that are permanent versus temporary improvements from behavioral changes. There are advantages to both, but I’m not worried that we will run out of the temporary options that can be gained from short-term behavioral changes. We’ll always have some options for voluntary actions during droughts.